Oops. You forgot to enter some information. This title is the first thing buyers see. It's the headline for your listing. This let's buyers know exactly what you're selling. Include a brand, model, size and year if you can. Brand: Who made your gear? Examples: Salomon, The North Face, Burton. ? Model: The model identifies your gear. This lets people know exactly what you have for sale. For example, Denali Jacket. ? Size: Size is the most important descriptor in your listing. Buyers want to know that your gear will fit! ? Keywords: Keywords help sell your item faster. For example, camp stove, backpacking stove, compact, lightweight, camp cookware. Use commas to separate ? Would you like to decrease your price over time or set a fixed price? Why? 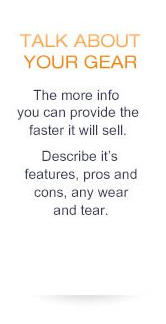 This allows potential buyers to make an offer on your item. You can chose to accept or reject any offer. Enter the Retail Price (MSRP). This is the price you paid for the item. This is the price you'd like to set for your gear. We suggest a price for you based on the condition of your gear and the retail price you entered. You can set your own price though! Enter the amount the buyer will pay for you to ship the product. 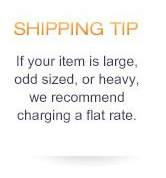 When the gears sells you are reimbursed this amount, even if you spend more or less to ship the product. Want to List Multiple Items? Copyright © 2000-2012 GearTrade, Inc. All Rights Reserved. Fast and secure. Best for small packages. Most reliable. Best for larger, heavier items. Cheapest method, but does not always provide tracking. Make sure you purchase tracking or delivery confirmation. Listing your gear is Free. If your item does not sell, we don’t charge you. 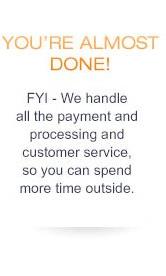 We handle all the payment processing and customer service. All you need to do is list and ship your gear - Then we send you a check. Follow the 5 easy steps to your left. We walk you through the process and provide answers along the way. Simply click on any field for more information. How do I edit/delete an Item? Click on “My Account” then click on “Currently Listed Items”. After you ship your item and update the tracking number in “My Account” we will mail you a check in 1-2 weeks. If your item does not sell there are no fees. If your gear sells, we charge a flat rate of 13%. For this we collect, verify and process the payment from the buyer. Unlike other auction sites, we guarantee payment from the buyer. We also handle all the customer service and advertise your gear. What happens when my item sells? We will send you an email with a shipping address. Simply ship the item to that address and REMEMBER to get a tracking number. The tracking number is your protection. We will send you an email with instructions for entering this tracking number online in your “My Account”. Once the tracking has been updated, we will send you a check. It's free to upload photos. We do not charge image or listing fees. 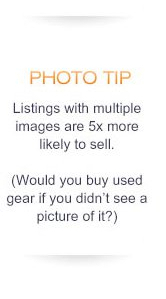 Listings with multiple images are 5X more likely to sell. 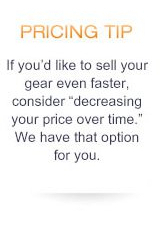 Your gear will sell faster for the price you want. Clean your gear before you take pictures so your gear looks great. Take photos on a clear background. It is best to use a white wall or a white sheet. If that is not an option, a sidewalk or driveway works well. Take photos of any key features, size labels, tags, etc. Detail the wear and tear. Displaying detailed images informs the buyer and minimizes the chance of return.